9" Wide Rollers - actual width is 3/4" wider. Maximum carton width is 13-1/2"
14-gauge galvanized member attaches to the full length of front and rear beams. Lock arm secures Span-Track on all three planes. Enables one to easily change, modify or relocate track without tools. Adjusted front/back, left/right, flush/overhanging. Plastic roller wheels can be expensive to maintain and replace. Downtime is a problem. Unex Span Track eliminates the problem by eliminating the wheels and replacing them with ultra-reliable, rugged duty aluminum rollers. This eliminates the high cost of replacing damaged plastic wheel tracks. 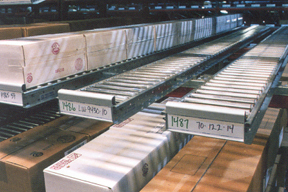 Add to that the versatility of being able to change a single shelf in a single bay of pallet rack into flow storage, and you can configure a reliable flow module "on the fly" that will last years. Product Capacity: Up to 50 lbs./ft. Roller Centers: 1", 2", & 3"
Knuckled Ends are available as a high profile section with a 15-degree tilted front end. Since this angles the carton toward the picker, visibility and accessibility are improved, making it ideal for loose pick applications. The knuckled section is available in three lengths (12", 16", & 20") and does not add to overall track length.